Minitokyo »	DURARARA!! 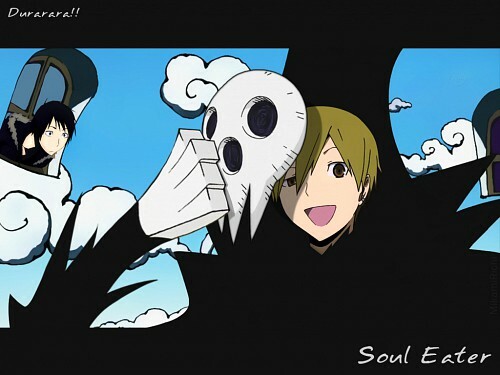 Wallpapers » DURARARA!! Wallpaper: Prankster Kid! She asked me to make a little collage, but I really liked the idea ... I tried very hard! The result was this.
? ??????? ???????? ?? ???? ?????! ?????? - ????? ?????????????? ???? ?, ?????? ? ?????? ??????! ?????? ??????? ????? ? ??????? ?? ?????? (??????? ?? ? ??? ?, ??????? ??? ??????!). ? ?????? ? ????? ??? ???? ??? ?, ???? ?? ????? ?????-?????? ???? ??? ? ????? ????... ????? ? ?????? ?????! You need a signature on the wallpaper. That is do Damn CLEVER ! Cross dressing both Durarara n Soul eater characters which i so love it! Thanks and please do keep it up with your creative art works.They're all AMAZIN! Is it just me but does this look a bit " scarry " to imagine . Wow two of my most favorite Anime merged in one image !